What is eSoftTools OST to PST Converter? eSoftTools OST to PST Converter is a converter tool for fixing and converting OST files. Installing Microsoft Outlook application is not required to convert OST files into PST, MSG, EML, and HTML, among others. It restores items such as contacts, notes, calendars, emails, appointments, and tasks. It also keeps the format of the email along with its email properties such as time, to, bcc, cc and folder hierarchy. eSoftTools also performs a quick scan of your file and generates a preview of emails, calendars, contacts, and attachments. Users can also restore mailbox items from deleted OST files. The tool is reliable in restoring and fixing your OST items even when they are damaged and corrupted. The system can be used with its demo version for recovering and saving a limited number of items from each folder. 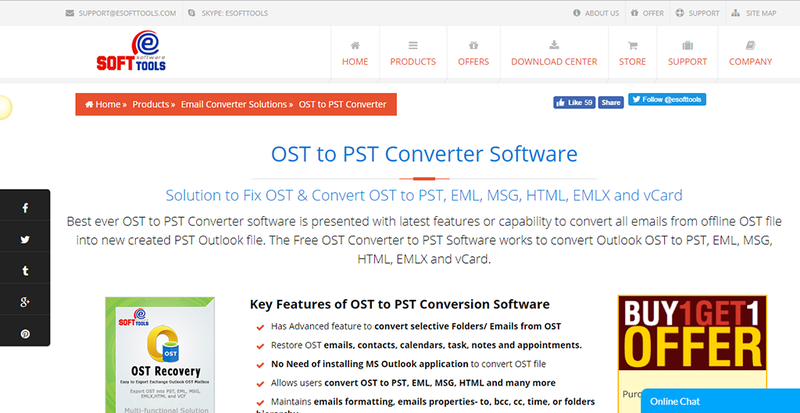 According to eSoftTools OST to PST Converter reviews, the tool can recover all items in your OST files such as emails, calendars, contacts, notes, tasks, and attachments. The format and folder hierarchy is preserved along with its properties like time, to, bcc and cc. Users have the ability to choose the emails and folders of offline OST to process with preserved data. eSoftTools doesn’t require you to install Microsoft Outlook to perform the conversion of OST into PST files. All versions of MS Outlook are supported from 1997, 2000, 2002, 2003 up to 2016 and works for 32-bit and 64-bit processors. One of the positive remarks in many eSoftTools OST to PST Converter reviews is the fact that the software gives you numerous saving options. It lets you recover damage and corrupted OST files and convert them into PST, HTML, MSG and EML formats. It also scans your files. To give you an idea on the items to undergo the conversion, the tool shows an OST preview.